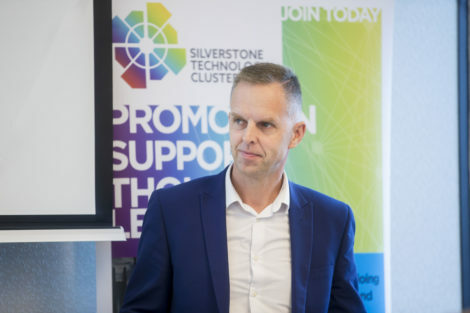 The Silverstone Technology Cluster (STC) has the potential to give the UK as powerful a voice in the future of automotive technologies and thinking as China. That’s the view of Simon Holloway, Champion of the STC’s Autonomous, Connected, Electrified & Shared (ACES) special interest group whose latest event attracted a sudden and much greater surge of interest from industry. The event attracted an audience of over 50 people and, while a long way off the 3000 which sat at Beijing’s EV100 conference in January, Simon was buoyed by the turn-out. “You think of the first time that ‘ACES’ met when it was launched 18 months ago… we had 15 people in the room but it’s kept growing with several events since. Now, at the start of 2019, it’s suddenly doubled to more than 50 and it’s that type of ‘snowball effect’ that you often see lead to much bigger things,” he commented. “There is a long way to go but we are really starting to get the ear of government and industry at large – sure, the China event is massive with debates involving several thousands of people including legislators, OEMs, start-ups, universities, academics and politicians and much of what is proposed is turned into legislation. Simon, Commercial Director for renowned auto-electrification expert RML Group Ltd in Wellingborough, is a regular traveller to China’s automotive conferences along with the key UK industry players such as government, the Advanced Propulsion Centre (APC) and Society for Motor Manufacturers & Traders (SMMT). He believes the cross-section of the audience at the ACES group’s event in late February and the type of discussions being reflected a significant shift in thinking. “Firstly, it was a very good mix of people: investors, users, people trying to enable users and sharing,” he continued. “The fact that the people in the room are from different markets and industries and clearly want to work together and take other industry ideas and implement them appropriately shows how the SIG has evolved. “The presentations now are less about raising people’s profiles and pitching for business and more about educating people about what the opportunities are and how collaborating can help them make the most of those opportunities.